When 10-year old Khadar Yassin came to his first class in the U.S., he spoke no English. He sat in a classroom full of mostly white students and handful of Somali kids. For the next year, he would only speak with other Somali kids, his cultural liaison and his accommodative English as Second Language (ESL) teacher. Yassin, now 18 and a senior, communicates in good English with everybody but is obligated to take ESL classes. He profoundly detests that. 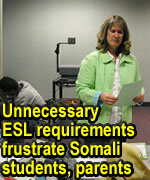 Yassin's frustration with ESL courses echoes a growing dissent among Somali students in Public schools and colleges. Many of them who were born and raised in the U.S. are obligated to take ESL courses by the school system, because English is not their “at-home” language. That haunts them the most. “They feel separated unfairly from other students.” says Hoodo Hassan, a program coordinator for Eftin, a nonprofit organization that helps Somali students close the gap and fit in the education system by providing after school programs, counseling and mental health training..
Hassan, who also offers cultural courses for school staff, says most Somali students have a negative impression about ESL courses. Some have even developed a stigma, particularly when pulled for ESL classes. Extra-curricular activities such as sports become a wishful something. What's more thwarting for them is that English is a primary language among them. They speak and write in English to each other. They speak “Somenglish”, a unique blend of Somali and English, only with their parents. Somali children's English proficiency requires them to speak on behalf of their parents who often don't speak English, wrote David McGraw Schuchman, a licensed clinical social worker who managed the Somali Mental Health Program at Community University Health Care Center for seven years in Bildhaan journal of Somali studies in 2004. As a result, most Somali parents neither help kids with homework nor attend parent and teacher meetings. Yet they expect their kids, especially girls, to compete with their peers. “That's the biggest challenge for Somali kids in schools.” says Faisal Madar, a cultural liaison at District 196 which includes parts of Eagan and Burnsville where sizable Somali families have children in the school district. Madar affirms that Somali parents are upbeat about their children's success in schools, but lack the necessary understanding of the complex education system, not to mention the language barrier. One Somali student whose father has regularly participated in the school system and eventually became a committee member is Osob Ali. Last year, she graduated from Eagan High School with honors. Now a student at Inver Hills Community College, she was recently awarded with the President's Emerging Leadership Scholarship and a special recognition from the college's president in the school paper. Madar, the cultural liaison, admired by many parents whose children attend District 196 for his compassion and parent-like coaching, says his number-one goal is to encourage a more parents like Ali's. He informs parents that free interpreters are available if they want to attend meetings and other school activities. He thought that would take care of the problem. A week later, he received yet another letter informing him that his son has to test out of ESL requirements. Cognizant of a clause in the school regulation that entitles parents to reject ESL courses for their kids, he refused the test. His son is now among the best in his peers “without ESL, ” he says. Some school teachers, however, don't believe that there's an over-promotion of ESL. “If a child is exposed to a foreign language at home, regardless of where they're born, he or she will certainly have a deficit in vocabulary and therefore is recommended for ESL. 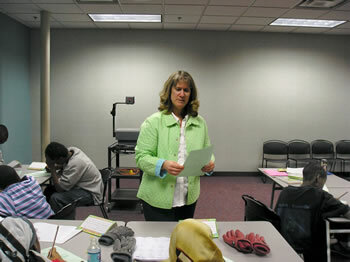 ” says Amy Olson, who teaches ESL at Nicollet Jr. High in Burnsville. She believes that most ESL students gain from it, but acknowledges that there might be a very small number who shouldn't have been there. “The stigma with ESL prompted many students to become emotionally and behaviorally disturbed,” says Hassan, the program coordinator for Eftin. Her organization recorded a rise in fights and disinterest in learning among Somali students in the last several years, especially in the suburbs, where they often have to compete with children of middle class families. “We probe [Somali Students'] grievances and suggest for schools to accommodate them within reasonable grounds.” she said. With his own experience, Madar also advises Somali parents whose children are American born, or have kids achieving well in schools to disenroll from ESL, because “it stigmatizes them.” Still, he apprehends the significance of ESL for many other kids who were placed on classes based on their age, not their education level. For Khadar Yassin, the high school senior who's graduating this summer, the ESL stigma follows him to college. He's been accepted at a community college. After testing, he's required to finish two ESL courses before taking college-level English course. “I can't wait to get over with it once and for all.” he says.